Our love with Holy Prophet Muhammad ﷺ is the base of our faith. Without this love our faith is incomplete. The unconditional love of Prophet Muhammad ﷺ is the real power of Muslims, that is why we Muslims always remain ready to sacrifice everything for the respect and prestige of Prophet ﷺ. Following the teachings of the Prophet and making him happy is the only wish of the Muslims so that on the day of judgment he may get the intercession of Prophet ﷺ. The country has to pass through the lawlessness and violence due to the decision of the Supreme Court in the case of Asia Maseeh. During the whole situation in the way propaganda was done against the Pakistan army, this might please the enemies of Pakistan who are afraid for a direct attack on Pakistan but want to make Pakistan weak internally so that hatred against Pakistan army is fueled in the Pakistani nation. Pakistani nation considers army cause of the problems and gets ready to stand against the army. So that when enemies of Pakistan attack Pakistan, the army has no national support. The enemy has been busy in hatching such conspiracies, even during the terrorism waged in Pakistan but the Pakistani nation stood with the army that is why Pakistan army laid down its lives and faced the enemies of Pakistan defeating them. Although Pakistan has been cleared from terrorists, the enemy is present across the borders. 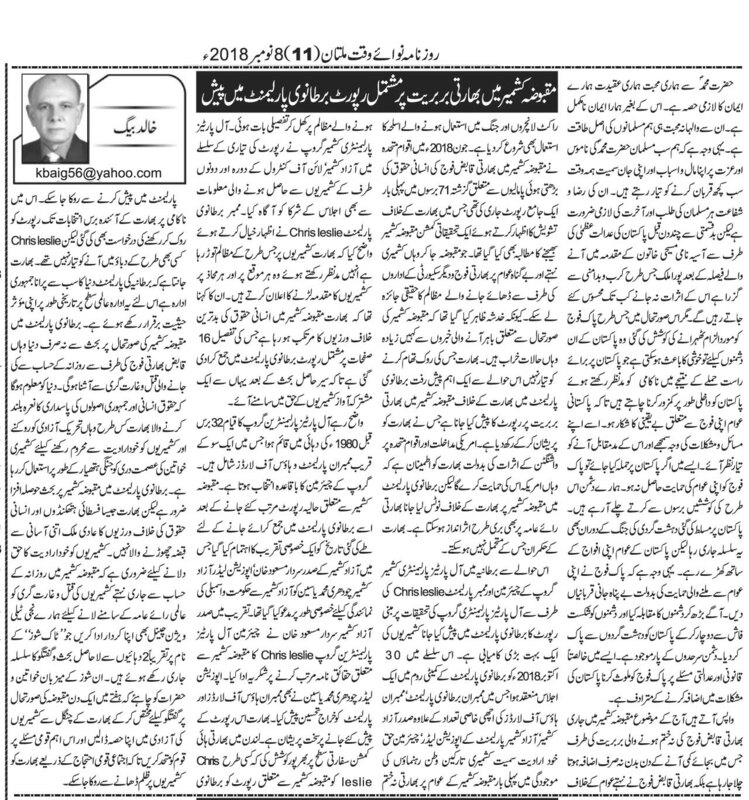 In such a situation involving Pakistan army in the totally legal and judicial matter would create prblems. Let's come towards the today's topic; Indian barbarism in Indian Held Kashmir (IHK) that is increasing day by day to continue Indian occupation in the Kashmir against the will of the Kashmiris. India is now using rocket launchers and other heavy weapons used in the war, against the unarmed Kashmiri protestors. In June 2018, the first time in last 71 years, UNO presented the report of Indian war crimes in the IHK in which concerns were expressed against India and it was decided that an investigation commission would be sent to Indian Held Kashmir. So that the war crimes of the Indian army in the IHK can be investigated. Because the news that has been reported might be giving a lesser violence than the reality. India is not ready to stop these war crimes. The next step has been taken by the British Parliament presenting the report of Indian Barbarism in IHK, this has created problems for India. Due to American interests in India and American control over UNO, India was sure that America will support her in UNO. But the notice of British Parliament will hurt Indian soft image in the International Community which Indian rulers cannot afford. 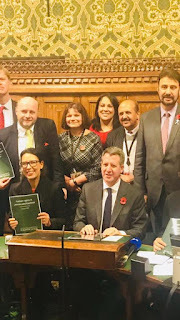 In this regard, the report of All Parties Parliamentary Kashmir Group’s Chairman and Member of Parliament Chris Leslie, presented in the British parliament which was prepared by the All Parties Parliamentary Group is the biggest success of Kashmiris. In this regard a session as held in the Committee Room of British Parliament on 30 October 2018 which was attended by Members of British Parliament, Members of House of Lords, President of Azad Kashmir, Opposition Leader of Azad Kashmir, Chairman Hurriyat and other Kashmiris living abroad and first time Indian inhuman acts and war crimes against civilians were discussed in detail. 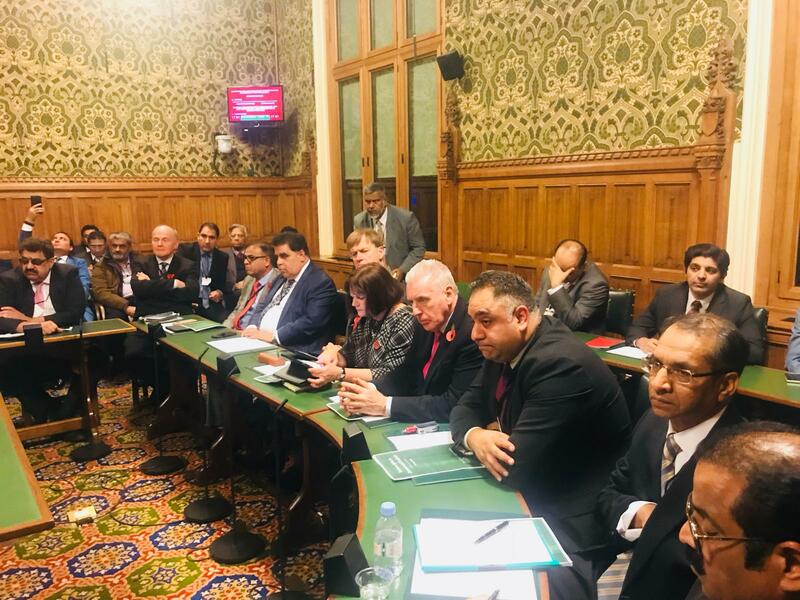 All Parties Parliamentary Kashmir Group gathered information from Azad Kashmir, visits of Line of Control (LoC), from the Kashmiris across the LoC, was shared. Chris Leslie told the meeting that in the way India is violating human rights and involved in state terrorism, he is ready to fight the case of Kashmiris at any place. 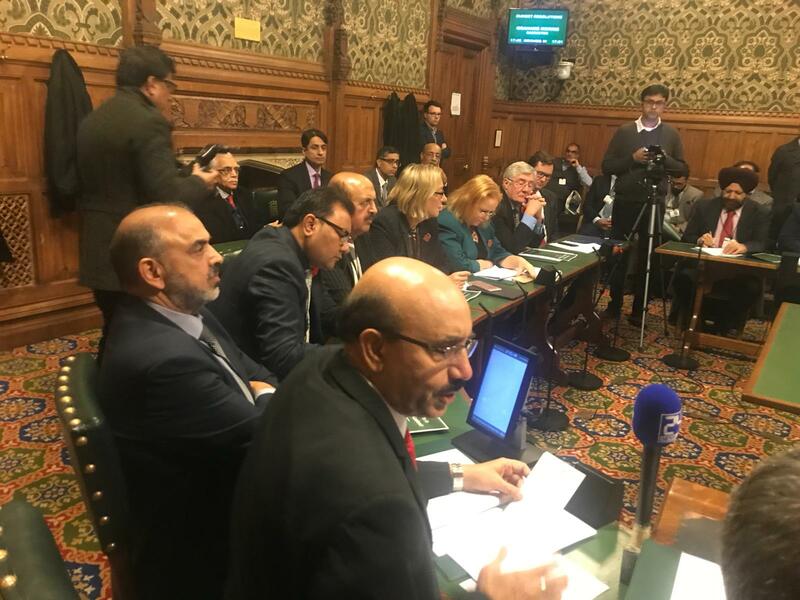 He was of the view that India is involved in the worst crimes against civilians in the history ever, the detail of these crimes has been submitted in the report of 16 pages to the British Parliament so that after the discussion the voice in favor of Kashmiris can be raised. 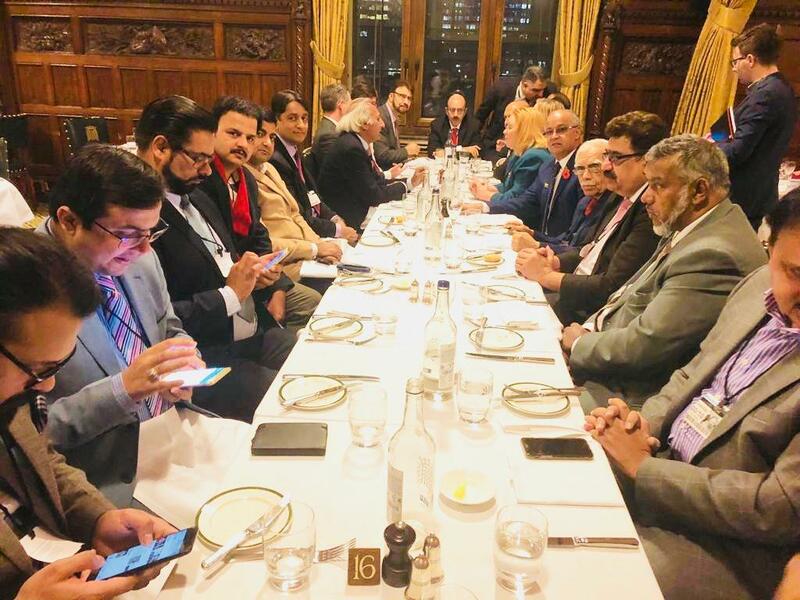 This should be kept in Mind that the above-mentioned group was established 32 years ago in the 1980s decade which includes more than 100 members of British Parliament and House of Lords. The Chairman of the group is elected. 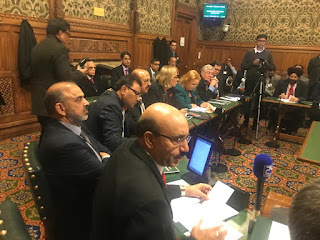 After compiling the report of Indian atrocities against Kashmiris, the date of its submission to British Parliament was celebrated as a gathering in which President of Azad Kashmir Sardar Masood Khan, Opposition Leader Azad Kashmir Chaudhary Muhammad Yaseen was specially invited to represent the govt. and Parliament of Azad Kashmir. 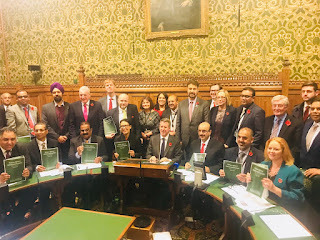 President of Azad Kashmir thanked Chris Leslie for the report. Opposition Leader of Azad Kashmir praised the role of members of British Parliament and House of Lords. India is concerned over the submission of the report. 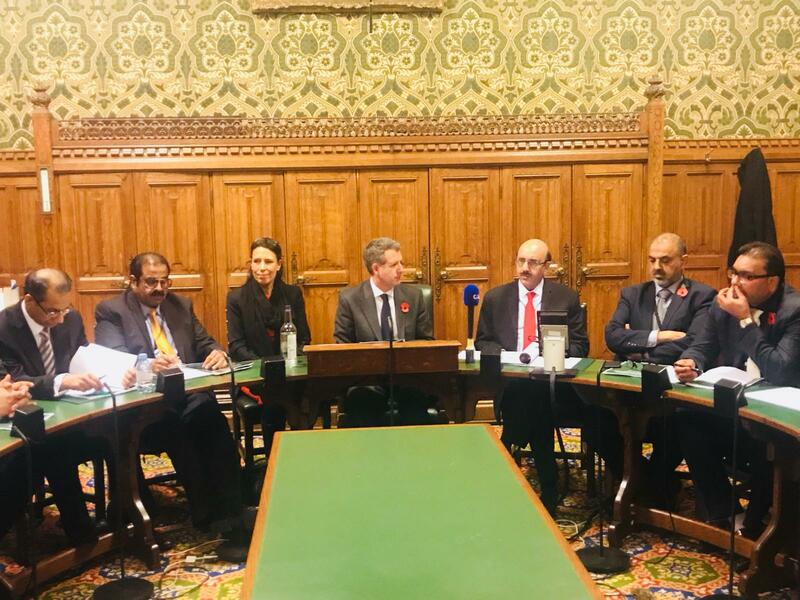 Indian High Commissioner tried diplomatically to stop Chris Leslie from presenting the report to British Parliament, upon failure it was requested that report should be postponed till the elections in India, however, Chris Leslie is not ready to accept any pressure.